Originally posted to the HuffPost on January 23, 2017. Click here to view. Late in the afternoon, Officer Kevin Vinatieri and Officer Mark Flores walk out onto the airfield of Auburn Municipal Airport. Sitting on the helipad is their patrol vehicle: an Airbus H-125 Astar helicopter. 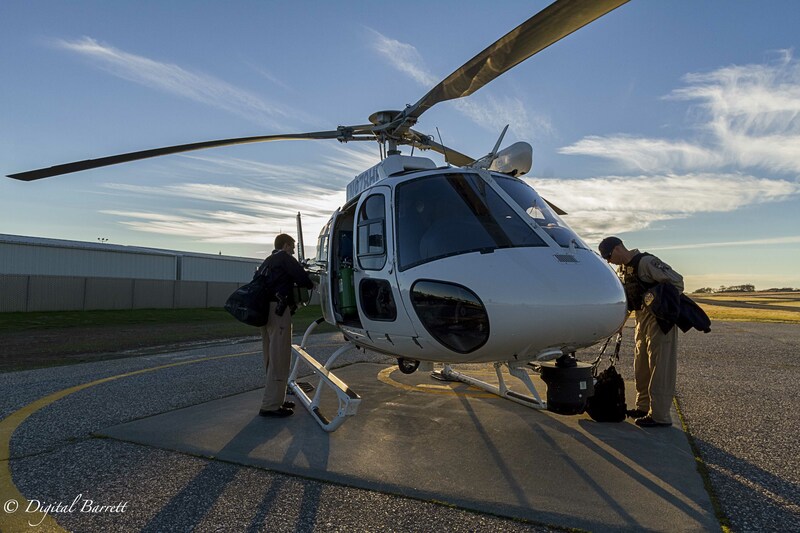 As the officers prepare for their shift, they walk around the helicopter, doing their pre-flight checks and reviewing their equipment. 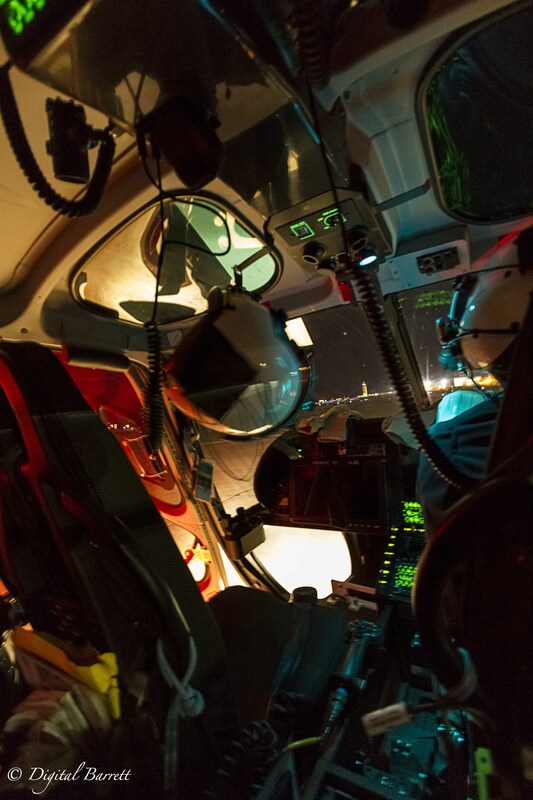 Once the external pre-flight checks are complete, both officers climb into the helicopter and prepare for take-off. After starting the helicopter’s jet engine, the rotor system begins to turn. Once full power is achieved, pilot Vinatieri gently lifts the helicopter into the air and hovers out to the runway. Helicopter pilots try to fly respectfully and obey the same traffic patterns as airplanes, however they are required to do so. Once making a traffic advisory call, Vinatieri lifts the helicopter clear of the airfield and soars off into the late afternoon light. 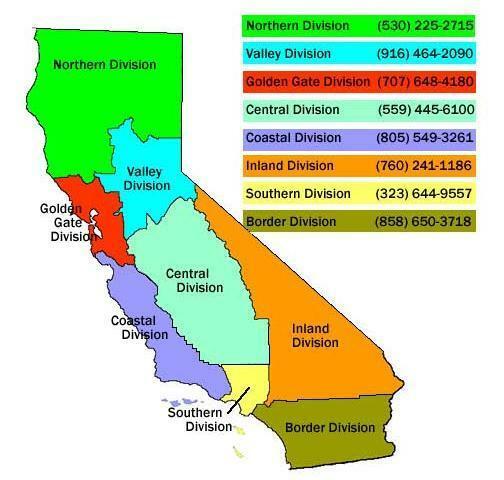 The California Highway Patrol (CHP) has nine divisions, eight with its own air assets. The aerial patrol vehicles include both fixed wing planes and helicopters. 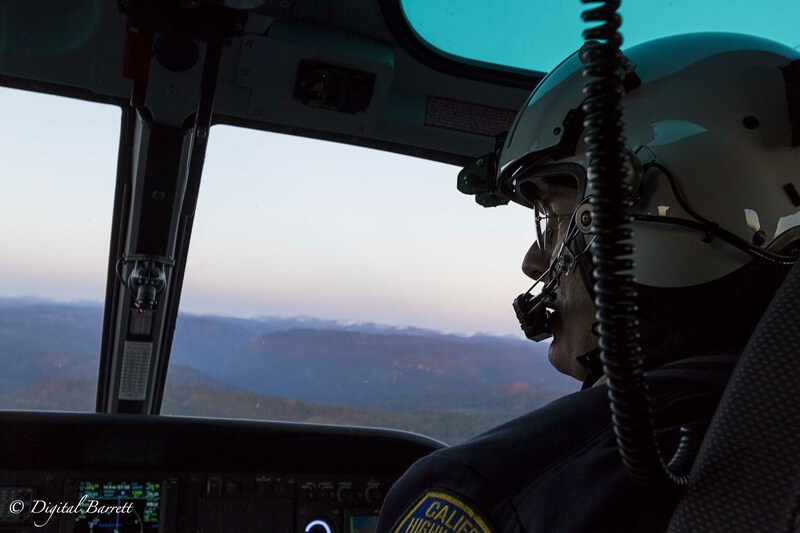 The Valley Division of the CHP patrols a massive territory, covering 13 counties from Butte and Sierra Counties in the north to San Joaquin and Calaveras Counties in the south. 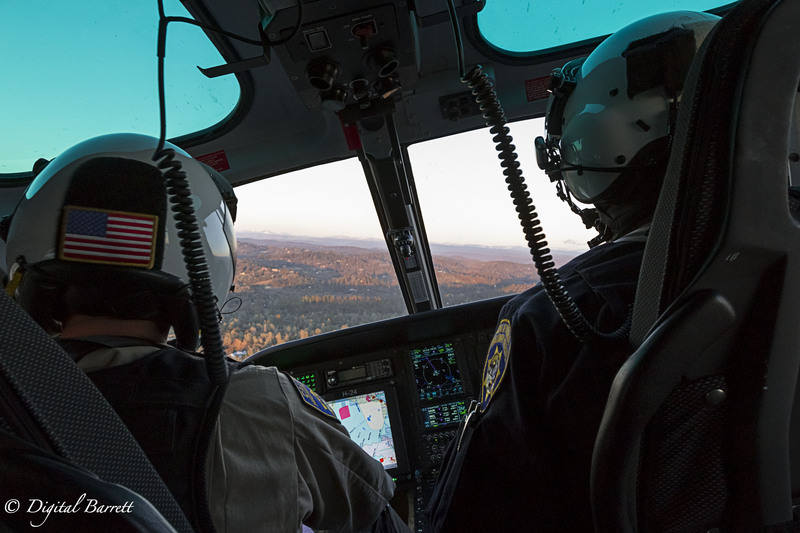 The Valley Division has two helicopters with three main missions: Law Enforcement support, Search and Rescue, and MEDEVAC. “The road officers are the backbone of the CHP. Our primary mission is to support them. But a helicopter or plane can cover a much larger territory during the same amount of time as a road officer,” Vinatieri said. Vinatieri turns the helicopter east to follow Highway 80 as it snakes into the Sierra Nevada Mountains. Officer Flores turns on the helicopter’s camera mounted underneath the nose of the aircraft. This camera is both a color camera and a thermal camera. As Flores demonstrated the range and capabilities of the camera, a call came in over the radio. There had been an accident and CHP ground units were requesting the helicopter crew come and search the accident scene for a possible second victim that was ejected from the vehicle. Once overhead, Vinatieri begin an orbit over the scene. “This camera is much more advanced than our last camera, so we can now fly at a higher altitude and still have a clear image of the ground,” Flores said as he zoomed in on the accident below. Also on scene was a local air ambulance company helicopter waiting to pick up the accident victim once he had been extricated from the vehicle. With the new higher quality camera, the helicopter crew can stay well out of the air ambulance’s way while scanning the scene. Flores flipped the camera to thermal mode which allowed him to look through the trees to locate any heat signatures that may be an injured person. “The ground unit isn’t sure if there was a second occupant in the car. Rather than having them search for a possible second victim, we can do that for them, allowing them to stay focused on managing traffic,” said Vinatieri. After searching the area around the accident repeatedly, Flores determined there was no other victim at the scene. He notified the ground units, and the helicopter turned to head back towards Sacramento. The Valley Division has six pilots and seven flight officers. They are a pretty small unit and being a team player is very important. In order to join the Air Operations unit, an officer must have at least two years as a road officer and, for the pilot, three hundred hours of Pilot in Command time. 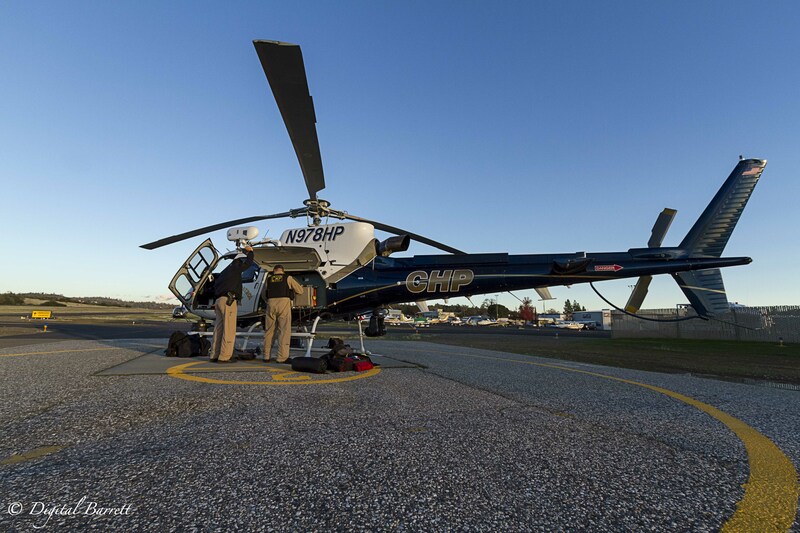 Even though the CHP helicopter has a two-man crew, only one of them is a pilot. The Flight Officer needs to be certified as a paramedic. In order to gain time as a Pilot in Command, an officer has to first be a private pilot, building their flight time on their own dollar. He or she can then go through additional training to get their commercial and instrument helicopter ratings. Many of the CHP pilots got their experience in the military. In the military, there are always two pilots in the helicopter. One pilot is doing the flying while the second pilot is coordinating the flight which includes communicating with air traffic control, keeping in contact with other aircraft or ground units, and acts as another set of eyes during the flight. For every flight, one of the two pilots is designated the Pilot in Command. Vinatieri got his flying experience from the military. In the early 90’s, he flew OH-58 Kiowasand UH-60 Blackhawks for the Army. He returned to the military in 2012 when he joined the California Army National Guard flying UH-60 Blackhawks and UH-72 Lakotas. He deployed to Afghanistan where he was a MEDEVAC pilot. He has been with the CHP Air Operations unit since 1998. “The mission of the UH-72 Lakota unit is very similar to the mission of the CHP Air Operations unit, so my training for each is very similar,” said Vinatieri. Flight Officer Mark Flores has been with the CHP for almost 20 years. After sixteen and a half years as a patrol officer, he joined the Air Operations unit in July 2013, and officially started working with the Air Operations unit after completing paramedic school in December 2014. The sun was setting, turning the horizon a brilliant orange color. The helicopter cruised along with both Vinatieri and Flores scanning the roads below. The highway and road systems function just like arteries in an organism, cars moving along the highways like red blood cells. When there is a change in the traffic pattern, it’s noticeable. 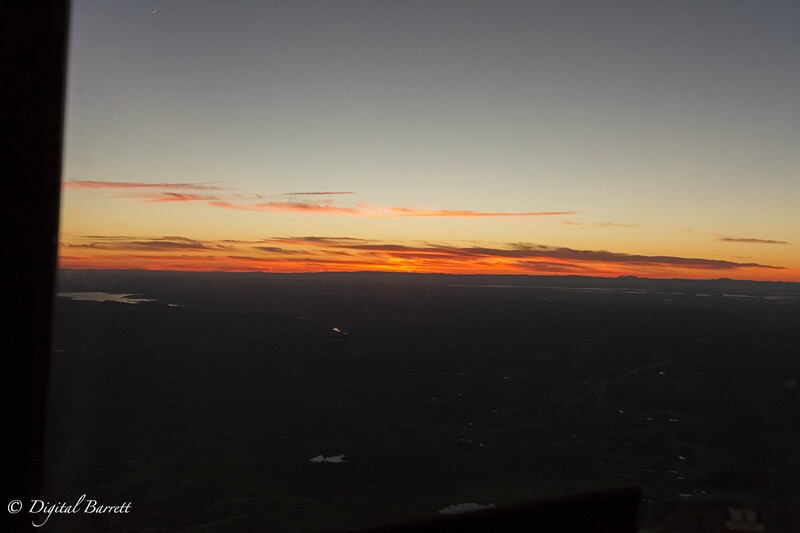 “We spend so much time up here, we get to know the ebb and flow of everything. Sometimes we spot a problem and even we are surprised we saw it,” Vinatieri remarked while cruising above evening traffic. As the helicopter approached Folsom Lake, another call came in over the radio. The park rangers were pursuing a man who fled from the scene of an accident. He had gone into the area around Folsom Lake, and they requested the CHP helicopter come and assist in the search. The sun had now set, Vinatieri picked up a standard search pattern over the southwestern shore of the lake. Below, ground officers were scanning the dark with flashlights. A canine unit was also present, trying to sniff out the suspect. Flores aimed the thermal camera at the officers and scanned ahead of them. The man they were searching for had a 15-minute head start on them so it was unlikely he was going to be located. When a helicopter arrives at a scene to assist with a search, most of the time the suspect will stop moving. Unsure of what exactly the helicopter can see, suspects usually hide. This leads to one of two things: either ground officers locate the suspect because he is no longer fleeing or when he does make a move, the helicopter can immediately spot the movement. “It is a bit of a cat and mouse game. We can see a lot, even from a great distance so sometimes when we move off, the suspect will think it’s safe to move, and that’s when we spot him,” Flores said as he scanned the forest. The camera picks up any and all heat signatures. Rocks and trees retain a surprising amount of heat and make it challenging to identify individual heat sources. But with his many hours of thermal camera experience, Flores is pretty sharp in figuring out what he is looking at below. The helicopter was getting low on fuel, so Vinatieri radioed to the ground units to say he would need to break off to go refuel, but would return if they still needed him. After getting a response, Vinatieri turned away from Folsom Lake and approached McClellan Airfield. After a quick refueling, the helicopter was up again. 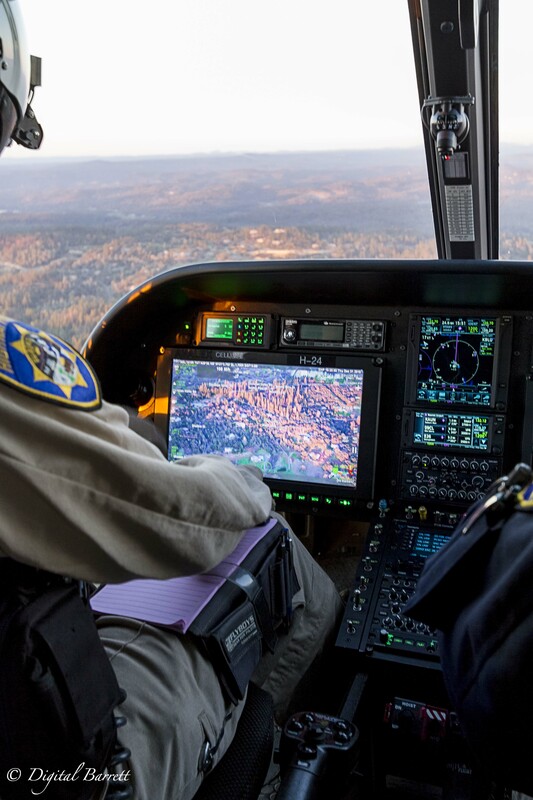 The helicopter has an operational endurance of about two hours and a range of approximately 350 nautical miles, but the way the CHP has it configured and due to its weight, its fuel endurance is restricted to two hours. After returning to Folsom Lake and continuing the search for a little while, Vinatieri decided to continue patrolling. The Placer County Sheriff’s helicopter unit had arrived while he was refueling and was assisting in the search as well. Vinatieri picked up highway 80 and cruised westward. The winds were quite strong, approximately 35 knots. When dealing with a crosswind, in order to keep the fuselage of the aircraft level, a pilot must keep the aircraft “in trim.” If a pilot were to fly an aircraft directly from point A to point B in a straight line, the crosswind would blow him in an arc. By orienting the aircraft into the wind, he is able to not only keep the fuselage level, but also allow the aircraft to travel directly to the destination in a straight line, even though the aircraft is aimed in a slightly different direction. Another call for assistance for the CHP helicopter. A suspect had fled into an apartment complex and ground units had established a perimeter, but needed the assistance of the helicopter to help them locate the suspect among the many buildings of the complex. Once over the scene, Vinatieri positioned the helicopter at about 1500 feet. Even from this great height, Flores was able to use the thermal camera to scan the streets and sidewalks below. The camera only picks up a heat signature, so it’s up to Flores to make a determination of who or what he is seeing. Several heat signatures appeared on the screen. “Pretty sure that’s an officer. Yep, an officer,” Flores said while panning up one of the side streets. As Flores located each heat signature, he has to determine what he has found. Officer? Bystander? Or suspect? Flores caught a glimpse of a person standing flush against the back of a building. He watched the figure for about a minute. Vinatieri was keeping a very stable hover, but Flores asked him to move just a bit to the left so he could get a better look at the heat signature he had found. Just as he was about to radio ground officers to check out the figure he had found, he saw a dog and realized the figure was standing outside with his dog. Flores moved on. From their vantage point, Flores and Vinatieri can search a larger area more quickly than the ground units. “It’s still up to the ground units to do the majority of the work. We’re just another set of eyes,” Vinatieri said. Whenever he has to hover the helicopter, Vinatieri immediately locates suitable landing zones should he need to make an emergency landing. The helicopters are very well maintained, but like any machine, failure is always a possibility. Unlike a fixed wing aircraft, a helicopter is able to land without a runway. In many ways, an engine failure in a helicopter can be safer than an engine failure in a plane. If an engine fails in a helicopter, the engine stops putting power into rotating the rotor system. But the blades are still airfoils. 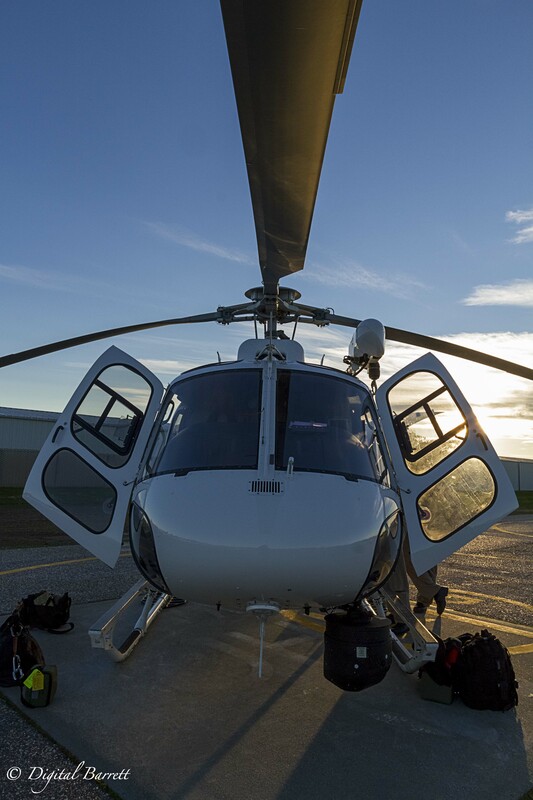 As the helicopter descends, the pilot can maintain controlled flight because air that is moving up through the rotor system will actually spin the whole system providing lift. As the aircraft nears the ground, the pilot will “flare” the aircraft to slow the descent and make a safe landing. The landing will probably be a bit rougher than under powered flight, but both occupants and the aircraft should be safe. Over the radio, the officers hear that the suspect, a gang member with several warrants, had been located at one end of the complex. Vinatieri moves the helicopter around so Flores can get a look. Two officers were on the ground talking to the suspect who was on a second floor balcony. Everything looked under control, so Vinatieri turned the helicopter east to follow Highway 80 back towards Auburn.